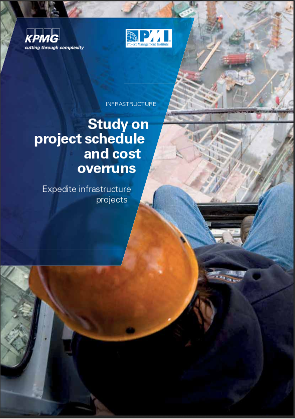 The recently released report by KPMG-PMI on Schedule and Cost overruns on Infrastructure projects in India is interesting to read. The summary is that lack of qualified project manager and other engineering resources along with external issues such as regulatory delays, site handover, poor scope management are the major causes for Schedule overrun. Poor resource, procurement and scope management are identified as some of the major issues causing cost overrun. As per the report, these can be addressed easily by improving the PM capability of the organization. Lack of skilled manpower, impacting schedule is felt deeply in Coal, Steel sectors followed by Power, Roads&Highways and then by Railways, Telecommunication. Scope creep, Design change, Environmental safety are major causes affecting cost overrun in Steel and Civil Aviation sectors. Telecom sector seemed did no have cost overrun. 86% of survey participants have expressed the need for PMOs to address the Schedule and Cost overruns and some have already established an internal PMO/engaged an external PMO. 56% have reported use of Risk Management practices and 76% stated that their Risk management is effective. Therefore, the conclusion that poor risk practice could be the reason, based on the fact that 53% are behind schedule and 34% overspend seemed a bit surprising, though the report covered various issues that impacted the project in the preceding chapters. Taking the case of construction sector, the demand for project managers is estimated at 70,000 in 2010 moving to 2,27,500 by 2022. Supply was projected to be 1,20,000 as per the twelfth five year plan. As the number of civil engineering seats have not grown well in the past(possibly due to the lure of CS/IT), it was recommended to introduce PM as a subject in Civil Engineering. The report also provides a set of recommendations to expedite infrastructure projects. Three tier PMO (National,State, Implementation level) and setting up internal Project Academy in each organization as was done successfully by IT industry are some of the recommendations. The report also had few case studies on how different organizations are dealing with the challenges. While the report looks good overall, it could have been improved by use of visuals from Indian construction scene, rather than some stock photography of western country infrastructure projects. When I joined engineering 29 years back, I opted for Electronics & Communication Engineering, which was least popular. I was glad that I was able to land a government job through campus placements, when I finished the course. My civil engineering friends had a hard time getting jobs. Some of them moved to Computer Science(CS)/Information Technology(IT) for their post graduation course and had made a good career subsequently. Looks like what is required is the reverse now, as there is a glut of CS/IT engineers, many of whom could be easily trained for Project Management through short term bridge courses, which the report authors seem to have missed.